Rich and successful people are at the top of the list when it comes to living the good life. Are rich and successful people smarter, luckier and more deserving than anyone else? So what’s makes a person rich and successful? It’s a great question that you deserve to know. Afterall, success leaves clues. Lots of them. Success in business and life requires that you know what not to do as much as what to do. I wrote all about what not to do in my post 9 Things Rich And Successful People Never Ever Do. Now that you know what not to do let’s focus on what you must do if you want to become rich and successful. Let’s leave the theory, myths, and guessing behind. Instead, let’s focus on nine proven strategies that work. What are these nine prove strategies and where do they come from? I did the heavy lifting for you with decades of in-the-trenches experience that built me an eight-figure business. Easier said than done when I started out with no money, experience or team. On paper, I was a failure waiting to happen. Along the way, I broke bread with billionaires, millionaires, and ultra successful people. I asked the right questions and received the right answers (all of which I will reveal to you). And I’ll share with you the latest and greatest research on what it takes to become rich and successful. So, you ask, what are the nine things that rich and successful people always do? Keep on reading, and you’ll find out. Rich and successful dream big dreams. All day. Every day. Want to live the life of your dreams? Create clear and definite goals. I started my EdTech, Embanet, out of my parent’s attic by day which doubled as my bedroom by night. What I lacked in money, I made up for with my dream to change the social fabric of society one learner at a time. I became a legend. That is a legend in my mind. Enter Napoleon Hill and his book Think and Grow Rich. My journey from failure to success started the day I created my Definiteness of Purpose. Learn how you create your Definiteness of Purpose here and here. And know this. You’re not dreaming big enough if your goals don’t scare you. Every billionaire I’ve met dreamed big dreams. Dreams that were so big it caused people to laugh and scorn the future billionaire. If you want success, dream big dreams. When it comes to a life of success, look no further than Jim Rohn. Rohn has helped the whose who of success. Think Tony Robbins, Mark Hughes (founder of Herbalife), Brian Tracy, and Jack Canfield to name a few. Schedule quiet time and think about what excites you, what you love to do, and what you want to achieve. Dream big. Each goal must be specific, measurable, attainable, realistic, and have a timeline. Find a mentor who will hold you accountable to your goals. Your goals are your lifeline. Do yourself a favor now and keep your goals to yourself. The only exception is to share with a mentor and person you can trust. Well-meaning family and friends have great intentions but often kill dreams. Rich and successful people wake up early, and so should you. What do Richard Branson, Tim Cook, and Jack Dorsey all have in common? Yes, they are all rich and famous. And they also all wake up early. Read this article for a full list of early risers. When I started my EdTech, I strolled in to start my day at 10 am. When you wake up earlier something inside you changes, and you open up the floodgates of success. You maximize and take advantage of your energy, focus, and willpower. Laura Vanderkam, best-selling author, and thought leader agrees. Vanderkam’s book, What the Most Successful People Do Before Breakfast, tells all. Waking up early enables rich and successful people to feed their soul. Vanderkam found that rich and successful people nurture their career, relationships, and themselves. Rich and successful people wake up early to read, meditate, exercise, plan, and reflect. When you wake up early, you take care of yourself first and position yourself for success the rest of the day. Rich and successful people wake up early. And so should you. What do Warren Buffett, Bill Gates, Mark Zuckerberg, and Oprah Winfrey have in common? Yes, they are all rich and successful people. But they are also voracious readers. Andrew Merle writes a great article on the reading habits of successful people. Reading has been the diet of rich and successful people throughout history. Read at least one hour a day for five days. You’re pushing the envelope, expanding your mind, and learning. Recent members of the 5 Hour Rule Club include Bill Gates, Warren Buffet and Oprah Winfrey. Read more about the 5 Hour Rule here. When I started my first company, Embanet, I had no money, experience or team. I failed every day. Reading books was my saving grace. From reading books, I found inspiration, courage, and ideas. And let me tell you. Ideas from titans of industry backed by your actions put you on the path to success. Massive success. Follow the lead of rich and successful people and read (a lot). Rich and successful people say ‘no’ more than they say ‘yes.’ And so should you. When to say ‘yes’ or ‘no’ is much art as it is science. When I first started my Edtech, Embanet, I said ‘yes’ to everything. Yes to meeting new people. It was a yes to flying out to conferences. I said yes to meetings. And it was a yes to seminars. By saying ‘yes’ more than ‘no’ at the start, you keep yourself open to opportunity and success. For me, one out of every fifty times I said ‘yes,’ I found value. But it only takes one. Over time I built momentum. And from momentum came success. What the one question I asked? If I agree to this activity will it move me closer to my definiteness of purpose? And this my dear reader is why having a goal, or definite of purpose, is key if you want to be rich and successful. That one question paved the way for millions of dollars in profits and massive success. Rich and successful people put themselves first, and so should you. Social media and the so-called experts have programmed you to put the needs of other people first. But social media and the so-called experts, as usual, are wrong. If you don’t take care of yourself, you become the infamous ship without a rudder. Your time and schedule are at the whims of everyone but you. Put yourself first so you can live your passion and life to be the most service to everyone. Best of all, when you put yourself first you create a life worth living. Read more about a life worth living here. Author and thought leader Sarah Knight agrees. Knight wrote the book, The Life-Changing Magic of Not Giving a F*ck. Unleash your happiness and success and pick up a copy of Knight’s book. You’ll thank me later. Putting yourself first means your goal is your North Star. Requests come, and requests go. By putting yourself first you position yourself for happiness and success. And when you’re both happy and successful, you’re in the best position to help those around you. Putting yourself first is not a license to be cruel. Instead, it’s an opportunity to align your life, actions, and time with your goals. Follow the lead of rich and successful people and put yourself first. Rich and successful people know that done is always better than perfect. Leave the concept of perfection for Hollywood. In real life, perfection is a myth and doesn’t exist. Customers either don’t care or won’t notice. You don’t exist if you don’t produce. Momentum. Doers have momentum from being in the market and win. Perfectionists aren’t in the market, have no momentum, and lose. Every time. Mind Set. Dreamers chase after perfection and nothing gets done. Action trains your mind. For a dreamer, getting things done today becomes ‘one day.’ But ‘one day’ doesn’t exist. Reputation. Your actions, not your words say it all. Perfection Is An Illusion And Doesn’t Exist. It’s A Numbers Game. You’ll never know if something is successful until you’re in the market. The more times you’re in the market, the higher your chance of success. Chasing after perfection eliminates this necessary process. And worst of all, your competition will demolish you. Time Waits For Nobody. You’re either in the market or not. Whether you’re a pauper or a billionaire, you have 1,440 minutes a day. Make each minute count. Rich and successful people are doers who leave perfection to the dreamers. Rich and successful people put their health first, and so should you. Columnist and thought leader Marguerite Ward writes a great article on successful people. Ward interviews a man who knows a thing or two about rich and successful people. In fact, more than a thing or two. Tom Corley has spent his life on the habits of rich and successful people. Corley found that 76% of rich people exercise at least 30 minutes a day. Jogging, biking, or walking were the favorites. According to Corley, 89% of all self-made millionaires sleep seven or eight hours a night. And you better believe that rich and successful people are eating healthy. Jenna Goudreau is the Managing Editor at CNBC. Goudreau writes a great article that reveals what rich and successful people eat. Success without vibrant health is failure. 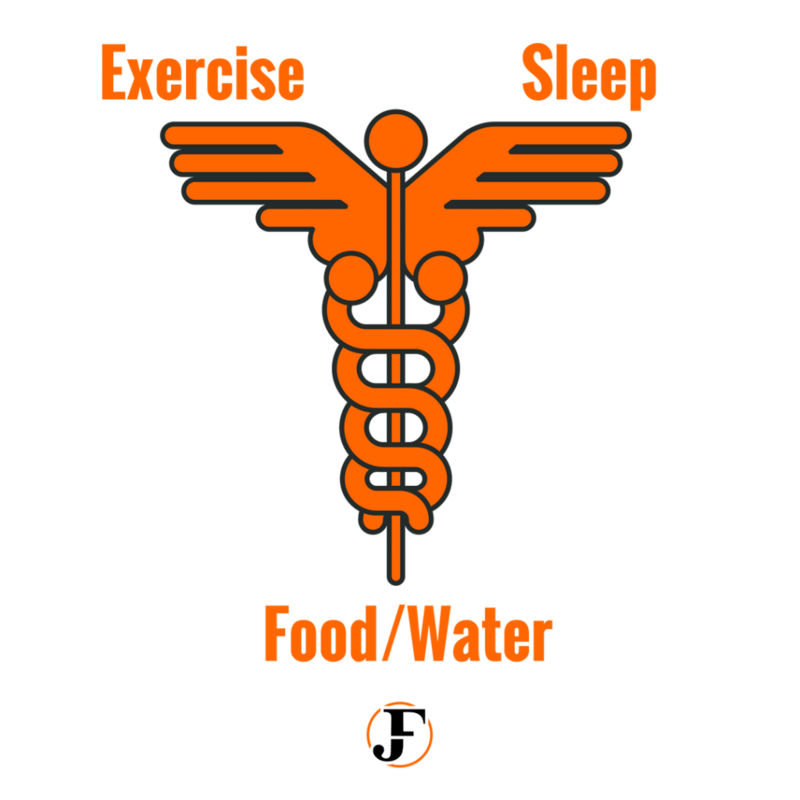 It’s the combination of exercise, sleep, and food that is the basis of the Health Trifecta™. In the early days of my start-up, brain fog, tiredness, and continual colds were my reality. My success skyrocketed once I took care of my health. To this day I experience boundless energy, endless concentration, and laser-like focus. And this, my dear reader, is a rich reward for minimal effort. Follow the lead of rich and successful people and put your health first. Rich and successful people know they are the average of the five people they spend the most time with. Knowing this, rich and successful people surround themselves with other successful people. You’ll learn more about what it takes to be successful. You’ll also reach new levels when you surround yourself with successful people. Why would a more successful person want to spend time with me, you ask, what’s in it for the other person? The only difference between you and a successful person is time. You have qualities, skills, and ideas that will teach and inspire those around you. When I was that kid right out of school with no money, experience, or team, I leveraged the success of those around me. I listened more than I talked. I observed. A lot. And I applied what I learned from rich and successful people into my personal and business life. A symbiotic relationship formed where the only agenda was to help each other succeed. Early on my circle of friends and contacts taught me to play to my strengths, not my weaknesses. Look for the positive in every situation. And knowing that in every adversity is the seed of opportunity. It’s no coincidence that Warren Buffett and Bill Gates are best of friends. Once again, Marguerite Ward pens a fantastic article. Gates and Buffett share how their friendship has helped each other. The only difference between you and your favorite billionaire is time and circumstance. Surround yourself with rich and successful people, and you start to become the person you want to be. Rich and successful people leverage the power of a positive mindset backed by action. Positive thinking on its own is not enough. A positive mindset combined with action unlocks the floodgates of success. The early days of my EdTech were overflowing with frustration and failure. A negative attitude would have had me listen to the naysayers and give up. My positive mindset that kept me in the game by having me with an open mind to opportunity. Although it took time, my EdTech changed lives for the better and became an eight-figure company. When you have a positive attitude that you back with action, you can and will achieve your goal. How do you develop a positive attitude? Find a problem you’re passionate to solve, and while you’re at it, enjoy the journey. Two things help me keep a positive attitude. And these two things are the same for most of the billionaires and ultra successful people I’ve met. Before starting your day, practice gratitude. Be thankful for things and people in your life who make a difference. Meditate to calm your mind and open you up to new possibilities. At the core of every so-called problem is the seed of opportunity just waiting to open up. This article’s title is about nine things that rich and successful people always do. If you’ve been keeping count, this is the tenth thing that rich and successful people always do. Why didn’t I stop at nine, you ask? Rich and successful people always go the extra mile, and so should you. Adopt this philosophy as a way of life in all you do. From the small things to the big things, always go the extra mile. You’ll be one of the few that do and stand out from the crowd. When you go the extra mile you speed up both your success and your opportunity to change peoples’ lives. Rich and successful people are rich and successful because they’re different. Does this mean rich and successful people are smarter or better than you? But it does mean that rich and successful people do things differently. Rich and successful people prove the experts and conventional wisdom are wrong. In this article, I’ve revealed nine things (plus one bonus item) that helped me go from zero to hero. In the process, I changed lives and built an eight-figure company with no money, experience, or team. You’ve read my in-the-trenches experiences for your benefit. I’ve revealed traits I’ve seen in my dealings with billionaires. And I’ve provided you with the best research on rich and successful people. All that said, know this and know this well. You already have everything you need within you. Right now. All you need to do is unlock your potential. Rich and successful people don’t wait for perfection and start right away. Start now. Take the first item in this article and master it. When you’ve mastered the first habit, move on to the next. Do this until you’ve mastered all the habits I’ve revealed in this article. Your success is waiting for you. Right now.